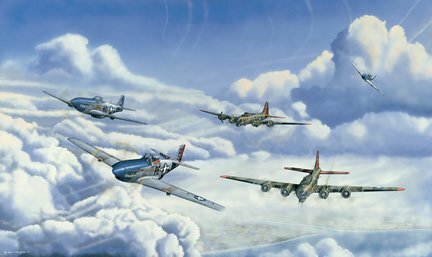 On November 21, 1944, the 8th Air Force launched 995 B-17 Flying Fortresses and 366 B-24 Liberators with the petroleum facilities near Merseburg, Germany as their primary target. After releasing their bombs over the target, “Nine-O-Nine” and “Outhouse Mouse”, two B-17Gs from the 91st Bomb Group, are seen flying over the Holland coastline as they head back towards their base at Bassingbourn, England. Escorting the two bombers are three aces from the 352nd Fighter Group; Major George Preddy (26.83 air-to-air) in “Cripes A’ Mighty”, Lt. Col. John C Meyers (24 air-to-air) in “Petie 3rd”, and Capt. Bill Whisner (15.5 air-to-air) in “Moonbeam McSwine”. These three aces ‘wiggle’ their wings to notify the bomber pilots that the “little friends” are leaving the formation. Capt. Bill Whisner, having shot down six enemy fighters during the mission, breaks away from the bombers to take the lead and head for their base at Bodney, England. It’s this moment that the painting captures. Limited Edition 550 hand signed and numbered lithographs (38" x 26"). Donald Bryan (13.34), and Alden Rigby (5), three POWs and two B-17 nose artists. Artist Proofs 50 hand signed and numbered.